The R-PLEX Human B2M Antibody Set includes a matched capture and detection antibody pair and calibrator for the quick and easy measurement of B2M in biological samples. R-PLEX products leverage MSD’s electrochemiluminescence technology for better sensitivity and a larger dynamic range than traditional ELISAs. R-PLEX matched antibody sets enable the development of singleplex and multiplex immunoassays. Individual assays may be developed using MSD avidin- or streptavidin-coated plates. Custom multiplex assays with any combination of R-PLEX analytes, as well as R-PLEX and U-PLEX analytes, can be developed on U-PLEX MULTI-SPOT plates. To learn more about the advantages of R-PLEX products click here. 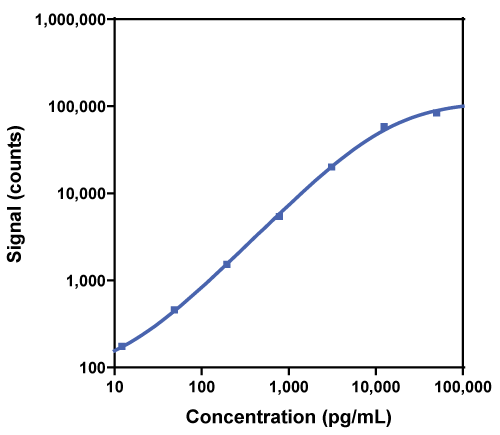 Calibration curve for the R-PLEX Human B2M Antibody Set was assessed and representative data is presented below. Description - Beta-2 Microglobulin (B2M, IMD43) is involved in the presentation of peptide antigens to the immune system. B2M is normally filtered in the kidneys, reabsorbed, then metabolized in the cells of the proximal tubules. Serum levels of B2M rise in renal dysfunction and are an indicator of allograft rejection in renal transplant. Elevated levels are also seen in chronic inflammation, liver disease, and several malignancies. It is considered as a good prognostic factor in multiple myeloma. Kidney injury biomarkers in hypertensive, diabetic, and nephropathy rat models treated with contrast media. Urine Biomarkers Predict Acute Kidney Injury in Newborns. Urine Biomarkers Predict Acute Kidney Injury and Mortality in Very Low Birth Weight Infants.